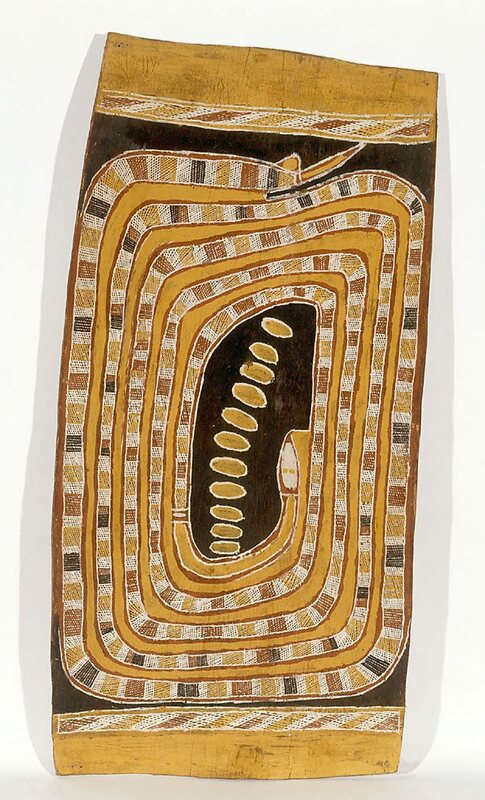 In 'Wägilak sisters story – Wititj (olive python)' 1961 Dawidi capitalises on the potential of the body of Wititj to create a graphic image based on line, colour and form. The dramatic use of black renders the snake subterranean, lurking within the waters of Mirarrmina and protectively guarding its young. Its coiled form is vibrantly painted with straight lines of miny’tji (clan designs), creating a mesmerising optical effect and reflecting the power imbued within this being. Gamarada , Sydney, 1996, 42 (colour illus. ).